North Korean foreign minister says Trump is on a "suicide mission"
NK foreign minister at U.N.
North Korean Foreign Minister Ri Yong Ho said President Trump is the only person "on a suicide mission," one that is making "our rocket's visit to the entire U.S. mainland inevitable all the more." "Due to his lacking of basic common knowledge and proper sentiment, he tried to insult the supreme dignity of my country by referring it to a rocket," Ri said. "By doing so however, he committed an irreversible mistake of making our rocket's visit to the entire U.S. mainland inevitable all the more." Will North Korea test a hydrogen bomb? Ri also called the president a "mentally deranged person full of megalomania," reflecting comments from Kim earlier this week, when Kim called Mr. Trump a "mentally deranged U.S. dotard." The North Korean diplomat claimed the North Korean regime possesses a hydrogen bomb that can be coupled with an intercontinental ballistic missile, and is prepared to use its latest technology if needed. Ri on Friday threatened to test a hydrogen bomb over the Pacific Ocean. Ri insisted it is the U.S., not North Korea, that poses an international threat. "The U.S. claims that the DPRK's possession of H-bomb and ICBM constitutes a global threat, even at the U.N. arena," Ri said, using the acronym for the country. "But such claim is a big lie which is just tantamount to the notorious big lie faked up by the U.S. in 2003 about the existence of weapons in Iraq of weapons of mass destruction in order to invade that country." Ri tried to argue that nuclear muscle power isn't the DPRK's first option. North Korea, he said, also only intends to target countries that join forces with the U.S.
"The Democratic People's Republic of Korea is a responsible nuclear weapons state," Ri said. "We will take preventative measures by merciless preemptive action unless the U.S. and its vessel forces show any sign of operating a decapitating operation on our headquarters or military attack against our country. However, we do not have any intention at all to use or threaten to use nuclear weapons against the countries that do not join in the U.S.military actions against the DPRK." U.N. Secretary-General António Guterres met with Ri after his speech, and expressed concern over tensions in the North Korean Peninsula, CBS News' Pamela Falk reports, citing a readout of their conversation. Guterres asked for deescalation, and for the DPRK to implement all of the U.N. Security Council's resolutions. Guterres emphasized the need for a political solution, and for continued humanitarian aid to North Korea. Moments before Ri was set to speak, U.S. Air Force bombers flew in international airspace east of North Korea. The Pentagon said it's the furthest north any U.S. fighters have flown in the 21st Century. Mr. Trump has only escalated his comments about North Korea this week. On Friday, Mr. Trump issued an executive order targeting countries that trade with North Korea. At a Friday night rally for Republican U.S. Senate contender Luther Strange in Alabama, Mr. Trump derided "little rocket man" -- his new favorite term for Kim -- and emphasized that North Korea would be dealt with. Earlier in the day, the president tweeted that he Kim is a "madman" who will be "tested like never before." Follow below for live updates from the speech earlier. The handful of members of the North Korea delegation offered their applause as Ri walked off stage, uneventfully. Although the U.N. and U.S. have imposed tougher sanctions on North Korea and its trading partners, Ri said that won't matter. North Korea is close to completing its nuclear weapons program, he said. 2:41 p.m.: Ri says North Korea doesn't intend to threaten countries that don't join U.S.
Ri said countries that don't join the U.S. in its nuclear attempts have no reason to worry. Ri said North Korea isn't eager to use its nuclear weapons capabilities, comparing the current situation to the "weapons of mass destruction" claims former President George W. Bush made to justify engaging in the Middle East. Ri said "hopefully" nuclear power won't be necessary, and that's not their "first option." But Ri said U.S. and its allies should "think twice" before threatening North Korea. 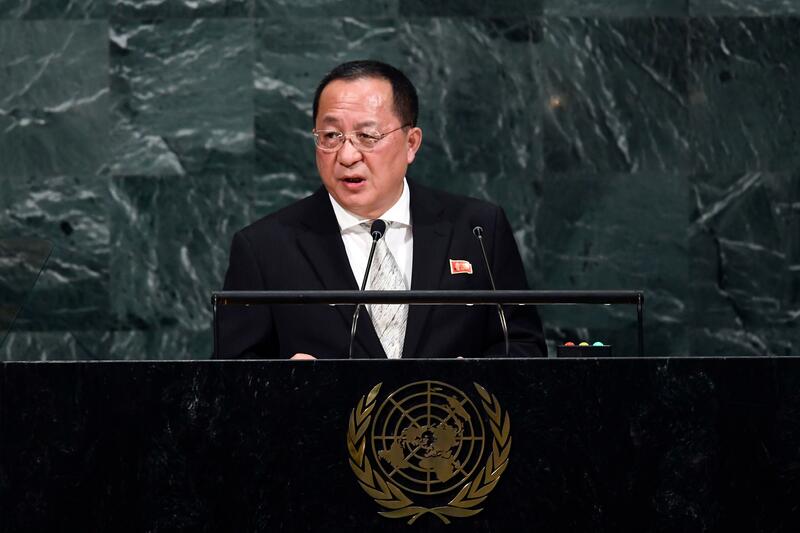 Ri says North Korea has nearly completed its nuclear weapons goals, including a hydrogen bomb. Ri said the weapons are intended to be a "war deterrent"
"The very reason the DPRK had to possess nuclear weapons is because of the U.S.," Ri said. 2:27 p.m.: Ri: "None other than Trump is on a suicide mission"
Ri said Trump will pay "dearly" for his speech. "Trump might not be aware what is uttered from his mouth," Ri said, adding North Korea will be "sure" he pays. Ri said he feels compelled to respond to comments from Mr. Trump, saying he poses a threat to international security. "Due to his lacking of basic common knowledge and proper sentiment, he tried to insult the supreme dignity of my country by referring it to a rocket," Ri said. Ri said Trump is, "mentally deranged and full of megalomania."